Application fee-400/- for SC/BC/PHC/Ex-Serviceman of Punjab.Fee 800 rupees for all others. Age as on 01.01.2015-21 to 37 years.Relaxable as per govt,rules. General Knowledge Multiple Choice Objective Type-20, Mental Ability-20,Arithmetic Skills (Mensuration and Accounts) 25 questions, English Language-05 questions,Punjabi Language-05 questions, Computers/Information Technology-15 questions,Agriculture-10 questions.Total 100 questions. Negative marking-For every wrong answer, 1/4th mark would be deducted. The Select List will be prepared strictly on the basis of merit. 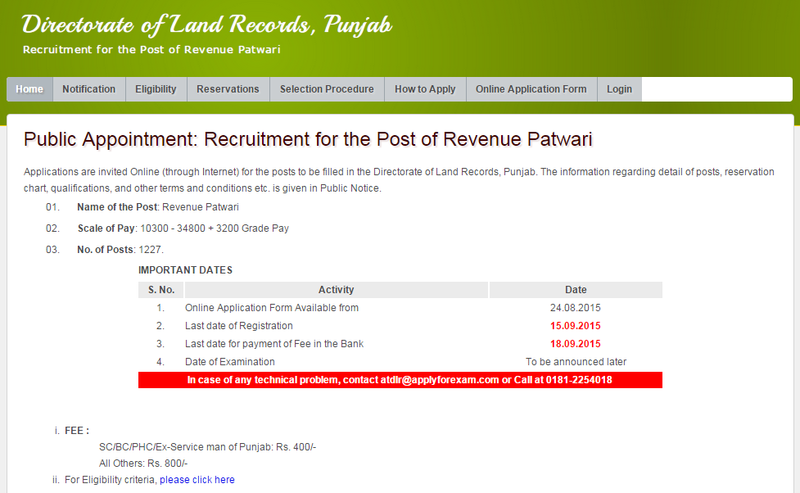 Application Fee-General : Rs.800/- and for SC/BC/PHC/Ex-Serviceman of Punjab Rs.400/- Tentative date of written test-In the month of October/November, 2015.